Ens@t-HT is an EU funded Horizon 2020 research and innovation project that will investigate hypertension and whether it is possible to develop more personalised approaches to treatment and disease management. The project comprises of a number of work packages that will focus on specific aspects and tasks. You can get an overview and the context of the project here. Below you can find out more about each work package and how they relate to each other. This work package will provide the expertise and the computing infrastructure required to support all aspects of the ens@t-ht project. This includes support for seamless, security-oriented linkage with the ENS@T-CANCER patient data registries and a variety of other data orientated tasks. The main objective of work package 2 is to provide genomics data from multiple individual platforms. Together with data flowing from work package 3, this compiled and integrated dataset will be the basis of multidimensional bioinformatic modelling and identification of molecular signatures in work package 1, to be subsequently used as omics-based circulating biomarkers in work package 4. The main objective of work package 3 is to identify metabolite signatures specific for different forms of endocrine hypertension with further exploration for stratifying patients with essential hypertension. 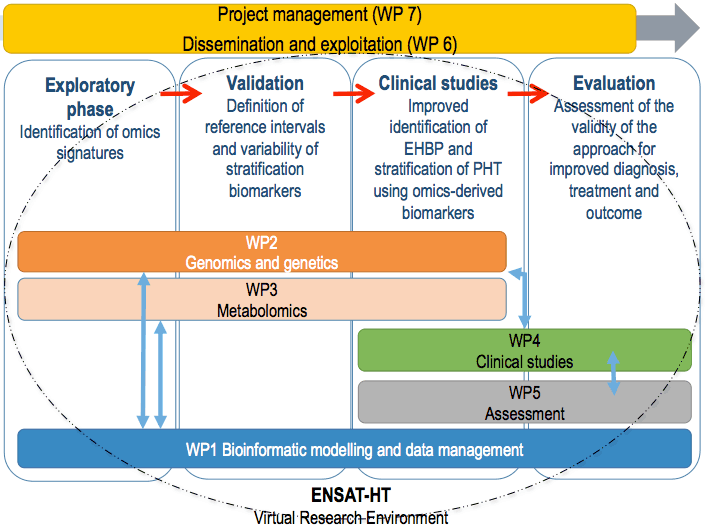 The main objective of work package 4 is to assess the validity and usefulness of omics signatures identified and validated in work packages 1, 2 and 3 for improved identification and risk stratification of patients with EHBP and stratification of patients with PHT. The main objective of this work package is 1) to identify a method to assess the potential medical, social, economic and ethical impact of a risk stratification for patients with endocrine hypertension and 2) to test it with the trial run in work package 4. The dissemination activities of the project will ensure international visibility and acknowledgment of the ens@t-ht project. This WP will ensure the optimal exploitation of the results of ens@t-ht. The management tasks of the project will be completed in this work package. Tasks will focus on strategic objectives and issues, managerial tasks and administration.